We talked last week about how a punk rocker named Joe Buck, along with other so called neo-traditionalist musicians that migrated to Nashville in the mid 90’s to walk the same streets Hank Williams did, helped revitalize the lower Broadway section of downtown. 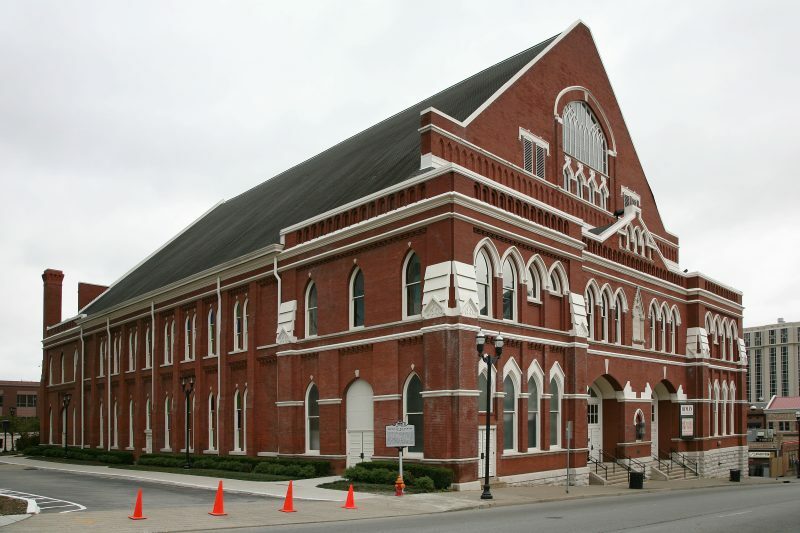 Well, all those venues that in the early 90’s were either abandoned or housing adult bookstores sit in the shadow, and share an alley with the mother church of country music, The Ryman Auditorium. From east Tenessee and back down home they came. Broad street will never be the same. Before Joe Buck, BR549, and other neo-traditionalists began to breathe life again into the streets and buildings of lower Boradway, a much more mainstream and established artist got the ball rolling at the Ryman. In the early 90’s Emmylou Harris was looking for a new direction in her music. She decided to disband her long-time “Hot Band” and put together a backing band based on an acoustic, more traditional bluegrass-like sound. 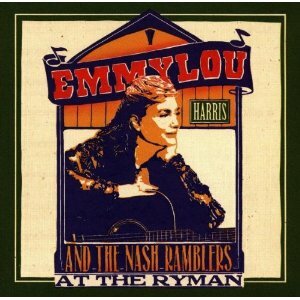 Yes, the early 90’s Emmylou could be considered a neo-traditionalist herself, bucking the popular trends of the time (Garth Brooks’ Ropin The Wind was the big album in ’91) to reach back to the roots of country music. She formed the “Nash Ramblers,” and what better way to make a splash in Nash that to launch the new direction at the Ryman. Starting on May 1, 1991, Harris started a series of shows at the mother church that stretched into 1992. It was like a shot in the arm for the Ryman revitalization. For almost 20 years, save for a few instances where it was opened for movies shoots, etc., its legendary acoustics had gone virtually unused, and now the home of country music was alive with sound again. Emmylou’s series of concerts are given universal credit for spurring the reopening of the Ryman in 1994, and it also resulted in an amazing live album called At The Ryman. Of course it received no commercial radio support, the CMA’s ignored it, but was well-received by critics and won the Grammy for Best Country Performance by a Duo or Group with Vocal. It has amazing songs done in a bluegrass style from an impressive stable of artists, including Bill Monroe, John Fogerty, Bruce Springsteen, Jack Clement, and of course, Hank Williams. The album also came with a companion recording of the May 1991 concert on VHS, which has some unbelievable moments, like Emmylou and Bill Monroe dancing together on the Ryman stage, and chill-inducing four part harmonies on “Calling My Children Home.” It also includes commentary about each song, and Emmyou’s thoughts on playing the Ryman. A Dutch site has uploaded the entirety of the concert, and it is a must see. I don’t know if I can put into words exactly how I think of The Grand Ole Opry as an institution. Perhaps I’m guilty of putting it up on a pedestal, because I didn’t come here as a child, I didn’t play here ever, I never saw a show here. It’s sort of something out of another world, you know, something almost fantasy…There’s a real sort of aura of magic about it. I get goosbumps thinking about it sometimes. Sitting here now, the fact that were getting ready to record an album here, I don’t know if I’ve actually made the connection. I know when we first talked about the possibility of doing it at the Ryman, I wanted it so much that I wouldn’t let myself think about it. That if they say “no” I’ll never recover. Luckily they said “yes” and the most important landmark on lower Broadway had a heartbeat once again. On March 15th, 1968, The Byrds, spurred in a country direction by Gram Parsons, won the right to perform at The Ryman through their label Columbia Records. The Byrds were met with a hostile response, including heckles, boos, and “tweet tweet” calls. 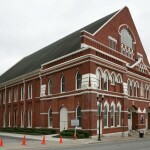 How funny is it that Gram’s understudy years later would be the one to revitalize the Ryman. I believe so much in the power of music, because my life was changed through music. Because I know of its power. I know how it can reach people everywhere. I guess specifically I’m talking about the kind of music I love. I call it country music… All music has a certain element in it that is real, this is like light, that can travel, anywhere, and touch people, anywhere. And to me, the music that was made at the Ryman is certainly, probably traveled farther and touched more lives than people ever imagine. Rhino announced at IBMA that Aero-Plain & Morning Bugle are getting reissued next year. With that said it’s always been a dream of mine to nail Emmylou at the Ryman listening to a Monroe record. The fact those albums are out of print, especially in this age of information we live in, tells me a lot about the priorities of the music business these days. Aereo Plane (or however the different authorities spell it) is one of my top albums of all time. I’m still waiting on the reissues of Larry Jon Wilson’s albums. I did find a fan site that has most of the songs in mp3 format copyed from the lp’s. Thanks Triggerman. Great story & it’s always great to get a new mp3 of something I missed. Love the song & videos. That whole Aereo Plane album is spectacular. I’ll probably do a review of it here shortly. Writing this reminded me of just how good, and how influential it was. I wonder if the Opryland complex getting flooded is payback of some sort for the Opry having abandoned the Ryman. I’m just sayin’…..
I’ve been to the Opry three times, twice at the Ryman and once at Opryland. I have no interest in going back to the Opryland theater for any reason. Another great blog Triggerman. I personally enjoy live albums because like Emmylou said, music is like light, it transcends and energizes. That is why I prefer attending as many shows as the good Lord, time and my pocket will allow. The energy and atmosphere is hard to reproduce but live albums . . . they give back. I stood outside the doors of the Ryman Theater way back in 1992 and not knowing even an 1/8th of what has transpired through the years involving that massive building and such, didn’t really have a grasp on it. All the memorabillia, all the history, all the light! It’s been shut off by money and greed and three piece suiters who forgot what it’s like to turn on the radio and be entertained. They forgot the times of the working man and women, the times when the only smile might have come from hearing Jimmy Martin and Hank, Ernest Tubb and Patsy. I commend Emmylou and Joe Buck for their respect of what Nashville could of been. It’s something else now. But the times I’ve visited Broadway I have been lucky. Good music still lurks there. I’m a gonna look for live at the Ryman today. I think I need to add it to my collection. First, thank you for the wonderful peek into the history of the Ryman and Lower Broadway — fascinating! Second, I hate to be ‘that person’ but I am a librarian, so it’s almost genetic…. you have two typos that actually change the meaning of the effected sentences. In both of these sentences, “Emmylou”™s series of concerts are given universal credit for spurning the reopening of the Ryman in 1994” and “On March 15th, 1968, The Byrds, spurned in a country direction by Gram Parsons” I believe you meant to say “spurring/spurred” not “spurning/spurned”. Minor, but with such errors is a librarian concerned, oft-times. Lovely work — thoroughly enjoyed the series!